From conception and development up to production – a Kalkhoff bike comes into being on site, in Cloppenburg, in the North West of Lower Saxony. And we are justifiably proud of our “Made in Germany”. Which type of bicycle, which trend, which target group? But also: what can we do better, what is the technological state-of-the-art and what is simply fun? These are the kinds of questions Kalkhoff’s product managers, designers and engineers ask themselves at Derby Cycle’s Innovation Centre. Driven by the motivation to always want to develop the best possible model. When setting out to develop the frame, the core element of every bicycle or e-bike, we start with a basic concept, a vision. That concept takes shape on a computer at the Innovation Centre. With the help of a 3D printer, the design can be evaluated from all perspectives early in the process. 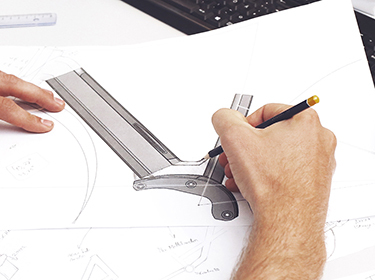 At the end of the first phase of the development process, a technical drawing forms the basis for producing the initial prototypes. They are subjected to extensive testing, improved and re-tested in our state-of-the-art test centre – until the standard requirements are met, as well as our own quality standards, which are sometimes significantly higher. By the time the go-ahead is given for serial production, the Kalkhoff engineering team has already been working on new ideas for a long time and the development cycle starts anew. Almost 500,000 bicycles and e-bikes produced each year. Over 700 employees are able to produce up to 2,800 bicycles a day – on ten assembly lines, five days a week and, at peak times, even working in two shifts.